Geordie was published in 1950 (though it was written during the war) and turned into a film shortly thereafter. I assume that after the horrors of war, people were in the mood for a gentle tale about an innocent Highlander who finds himself putting the shot for Britain in the Olympics in faraway America (though actually the 1956 Olympics were held in Melbourne, rather than Boston, as the novel surmises). Though it's pitched as a sweet, amusing story about a gentle giant and his love, wee Jeanie, and the rapacious Helga who sets her lusty sights on our naive hero, I found David Walker's novel pretty irritating. 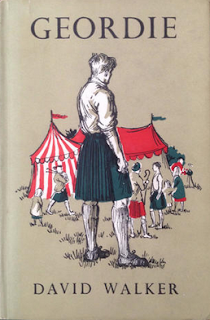 I have Scottish ancestry and Scottish friends, and I found myself bristling at the patronising, condescending tone of the book, the thick dialect and the thick heads of the Scottish characters. Also, this copy was missing twenty pages in the middle (to be honest, I don't think that affected my enjoyment). But I can't deny, Geordie is way buff. Check out that cover! How can anyone resist a man in a kilt? No wonder Helga got carried away.